As we’ve laid out before on this blog Anticipating Spring Marathon Season, the stakes at the top spring marathons in Rotterdam, Boston, and London are sky high. Last year’s Boston runner up and Chicago champion Moses Mosop goes first on Sunday in Rotterdam. Word around town is that it will take a world record for a Rotterdamer to make the London bus. Mosop will be pressed by two very scary Kenyan debutants who have done serious damage in the half-marathon, Sammy Kitwara and Peter Kirui. 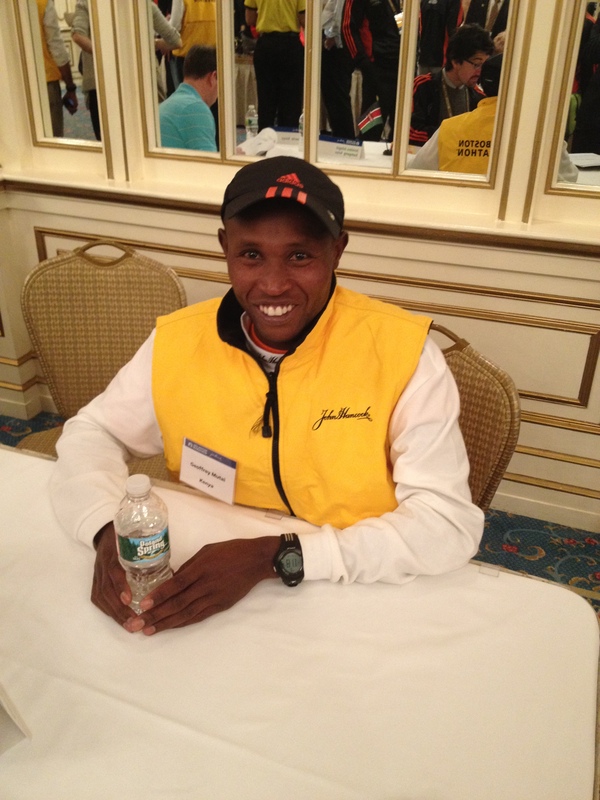 Then on Monday Geoffrey Mutai defends his best-ever 2:03:02 from last year here in Boston. I asked him today if there was a difference in coming in as the favorite this year with all the pressure as opposed to last year when he was just another one of the top guys. To aid in his quest, another of the Kenyan provisional Olympic candidates, Wilson Kipsang, called Geoffrey last month suggesting they train together for the final 2-3 weeks of their cycle. Kipsang won the Frankfurt Marathon last fall in 2:03:42, just four seconds off Patrick Makau’s “official” marathon world record run in September in Berlin. Imagine two of the three fastest men in history hooking up to prepare? 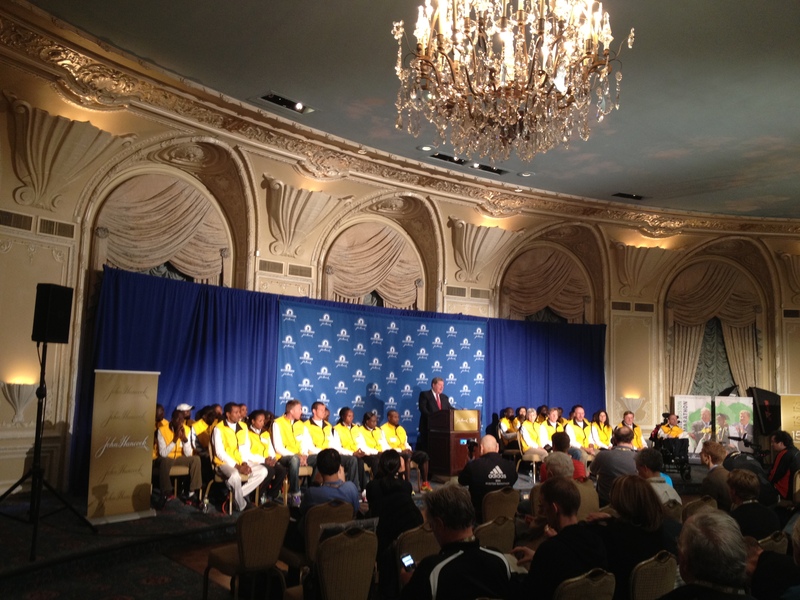 Kipsan, along with Makau, make their Olympic bid six days after Boston in London. Kipsang will have a much better idea of his chances after Mutai lays out his line. A couple of injury reports to pass along from today’s John Hancock press conference at the Copley Plaza Hotel, including Mr. Mutai. Nothing serious, he claimed, but he did admit to having had a small irritation in his right foot. He tweaked it during the very hilly San Blas Half-Marathon in Puerto Rico in early February where he bested 2:04:27 marathoner James Kwambai, a former runner up at Boston, by one minute 20-seconds. But the severe last 5K downhills took a toll on Mutai’s foot. He was scheduled to race the RAK ½ in the United Arab Emirates later in February, but begged off the race to let his foot recover. Though he did attend the event to pick up the AIMS/Asics Athlete of the Year Award. He also watched as one of his training partners, Dennis Kipruto, won the race. On the plus side, San Blas is a good indicator for Boston. Billy Rodgers was just outkicked by Henry Rono in San Blas 1978 on the way to Rodgers’ second Boston title. Mutai smiled when I told him the connection. He claims all is well now. Buzu is now being represented by Matt Turnbull who you’ll remember as the elite athlete coordinator for the Competitor Group and its Rock `n` Roll series of marathons and half-marathons. Matt told me the injury is to the outside of her right foot, and has been bothering her for a week. If temps do climb high on Monday, it could settle the pace early, and turn the race into a fast charge home from the Newton Hills in. Friday morning, the forecasters were calling for a Monday high of 84F / 29C, a frightening temperature in which to race a marathon hard. But by 2pm Friday the same forecast was calling for a high of 70 degrees, but with scattered thunderstorms and winds from the southwest at 20+ mph. At 4pm we were back up to mid-80s. As always in the New England springtime, ask me again in five minutes. It could change again and snow for all we know.